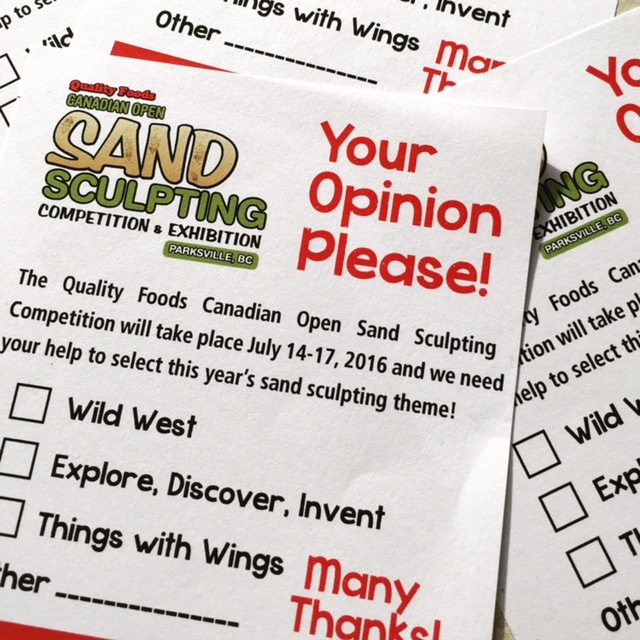 The Parksville Beach Festival Society is actively planning the 2016 Quality Foods Open Sand Sculpting Competition and Exhibition. Set to run July 15 through August 21 alongside Parksville’s magnificent beach, the sculptures will once again feature a common theme and community input is appreciated. “The master sand sculptors appreciate design guidelines and aim to please our visitors”, says Wendy Sears, Event Manager. The community can visit http://www.parksvillebeachfest.ca/theme-voting and vote for their favourite theme from a choice of three: “Wild West”, “Explore, Discover, Invent” or “Things with Wings”. Also, title sponsor Quality Foods, are providing customers with the opportunity to vote in person at their Parksville, Qualicum Beach and Nanoose Bay stores between January 25 and February 21. Cheryl Dill, President of the Beach Festival Society is pleased with how the 2016 plans are coming along. “We are discussing fresh ideas for our five-week-long event and I encourage people to vote to help us tailor plans to the theme that results from the voting”, comments Dill. International sculptor recruitment and sponsorship is the main focus at present. The Society will reveal more details later this Spring. For more information visit http://www.parksvillebeachfest.ca/ or email info@parksvillebeachfest.ca.